Enamel and Diamond Grasshopper Pin - P3019 at Reliable Gold in Rhode Island Reliable Gold Ltd. 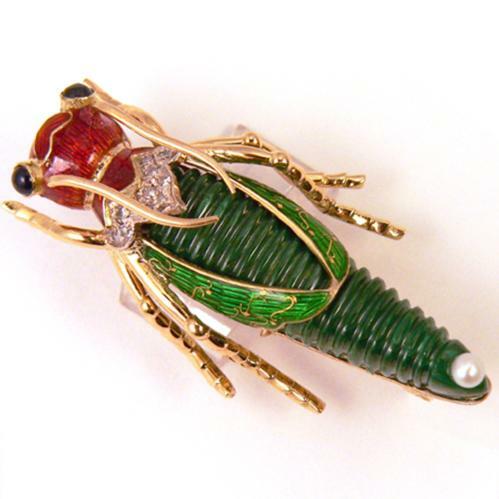 Fascinating grasshopper pin with carved malachite body, enameled wings decorated with delicate gold filaments, and diamond accents in this glorious grasshopper pin of 18k yellow gold with cabochon sapphire eyes and pearl. Sizes: 2 1/4" x 1 1/4"